I feel closer to my people. It's a feeling that feels like home. That the Sun enters my skin and tells me it's here to stay. My abuela taught me a prayer in Nahuatl a while ago. A prayer to the Sun. She said when she was in elementary school in El Salvador, they would pray to the Sun every morning. They would teach Nahuatl to the children. They would preserve a history that has long been violently stripped. I can't write it out, the prayer. So I memorized the fraction she taught me and sing it to myself whenever I'm in need of good energy. I can't understand this prayer to the Sun, so I tattooed it on my skin to be closer to the spirituality of my ancestors. It's a strange but royal feeling being a Latina in the United States. To not have the language some of your ancestors used to make sense of themselves in. To know that there are parts of yourself still at war with each other. I find one part constantly apologizing to the other, a constant reconciliation. But at the same time, a glow that only the Sun can understand. Even though Spanish was my first language, learned English in school, there are parts of me that want to learn Nahuatl, that want to learn Chibcha. To want to explore the fractions of my Colombian and Salvadoran indigenous history that go beyond borders. I've always known, but I'm relearning that to decolonize means going back home--to your roots. There has been a longing in me for that. So I went straight to the closest source to me, mi Mama Nena. 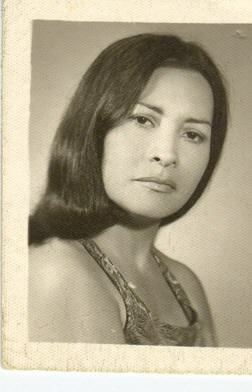 My abuela that raised me. We bond over meditation strategies, anxiety and chismes on the block. Even though she doesn't remember much back in school, she does remember the beauty of Nahuatl. She says, "Es Lengua, no Idioma". That Nahuatl is a tongue, not a language. Language is verbal expression. But the tongue, according the the dictionary, is the power of communication through speech. There's power behind a tongue. And even though it's a step, it's this tongue, mother tongue, that I'm starting to relearn.